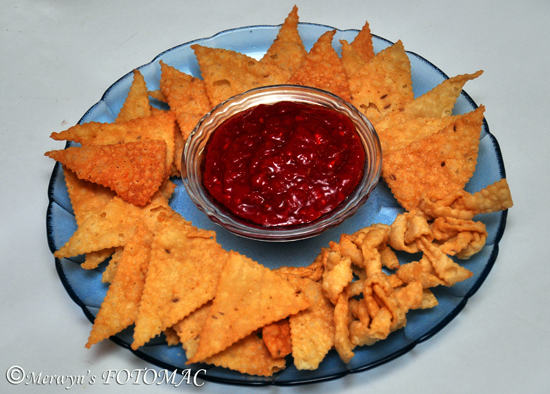 This sweet & spicy Schezwan Dipping Sauce is a real treat for spice lovers. It can be used in many Indo Chinese food preparations too. It is excellent with tacos, momos, spring rolls, wontons.. Remove the soaked chillies from the water & discard the water. Grind the chillies to a fine, thick & smooth paste using very little fresh water. In a sufficiently deep pan heat oil; add ginger, garlic, onions & saute well till onions are soft & rawness disappears. Next add the chilli paste & continue to saute till the oil starts separating. Then add the soya sauce & red chilli sauce. Add sugar, ajinomoto & stir well. Add the corn flour paste & stir well quickly so that it is smooth & not lumpy. Add vinegar; stir & let it come to a boil. Switch off the heat & let it cool completely. Serve as a dipping sauce. Use sufficient oil as oil acts as a preservative in the sauce when stored for a long time. Use soya sauce sparingly or the color of the sauce will change. Adding sugar reduces the pungent flavor. Use corn flour sparingly or the sauce will turn too thick. If you prefer a very smooth dipping sauce then grind together chillies, ginger, garlic, onions to a paste & then add it to the hot oil & saute.